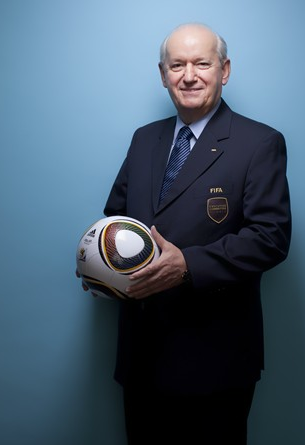 Fans and executives around the world today were shocked to learn that Senes Erzik, a member of FIFA's Executive Committee , has not been mentioned in conjunction with any bribery allegations regarding the upcoming vote for FIFA President. Stunned journalists were hesitant to go with the news, assuming there must have been a mistake, but indeed were impelled to relay that there are no reports, credible or otherwise, that Erzik was among those who accepted cash payments at a meeting called by Mohammed Bin Hammam earlier this month. Additionally, Erzik is not suspected of taking money for his vote for the 2018 and 2022 World Cups. Even more bewildering, Erzik, who has represented Turkey on the Executive Committee since 1996, has never been accused of taking bribes, promising votes, or any other type of illegal behavior in all his time with FIFA. "I can't believe it," one astonished fan said. "He works for FIFA? And he's not corrupt? Surely I would have heard about him before." Believe it. Erzik, also a Vice President of UEFA, has also not been named in connection with any of the match-fixing or bribery scandals that have rocked that association in recent years. Nor did he find his name splashed across the front pages during his time as president of the Turkish FA. "It looks like the guy's clean," says an English journalist. "I looked and looked through decades of our archives, but I can't find one single instance of Erzik betraying the game in exchange for money. Is it possible that he's just unaware that, as a FIFA member, people will offer him money for his influence? The man must be mental." FIFA has yet to publicly comment on the revelation that one of their own did not offer or accept bribes, but the association is said to be in turmoil over the unexpected news. "We'll have figure out what to do," said one FIFA rep who did not want his name used because he is currently implicated in three separate scandals. "We've never dealt with something like this before."